Ever wanted to have your phone built into something else entirely? With RePhone you can do just that. 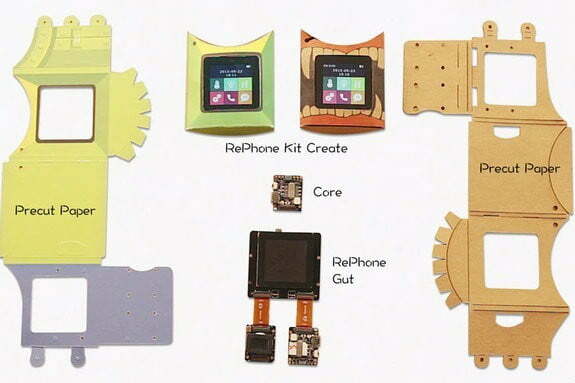 RePhone gives you the basic innards of that fancy phone in a series of modules, the software to control them, and enclosures to hold them. The kits are up on Kickstarter right now. The RePhone team asked for $50,000, and they’ve already gotten over $104,000. The idea is to provide you with the technological guts to give phone-like powers to whatever you want. You could make a mini phone with the premade kit, or a hat phone with a fitted cap someone left lying around your apartment, instead of sticking with a familiar form factor. The RePhone Core GSM + BLE with nano sim module is about the size of a stamp, and other modules can be attached using tiny NFC strips. With the 1.54 inch TFT touch screen, audio and GPS module, you can turn pretty much any object into a phone. The core module’s communication protocols are broad, including Bluetooth 4.0 and 2.1 dual mode. The 3G Core module comes with a standard Xadow interface for USB, audio interface support, Nano Sim, a button, LED and antenna, and a GPRS EDGE 850/1900 (which means it should work with AT&T and T-Mobile). RePhone offers several options: The basic kit, which is just the Core module with GSM+BLE; the Core Module 3G; the Geo kit with a Core GSM+BLE module, Xadow GPS v2, and Xadow GSM Breakout; the Lumi kit with a Core, a Xadow Dunio and a Xadow GSM Breakout; the Create kit, which comes with a Core and audio module, and a touchscreen. There are other modules available to further expand RePhone capabilities, like a Xadow dunio, basic sensors, a 520mAh battery, and 11 and 35 Pin FPC cables. If you want to use RePhone in something like the shape of a traditional phone, there’s the Kraft paper enclosure. Fold it on the lines, and it assembles into a holder that leaves you with a phone that fits in the palm of your hand. It’s easy to decorate and if you draw on it or cover it with stickers you won’t feel like you’ve permanently defaced a $600 purchase. Phones are just the beginning, though. With the GPS and Core modules, you can make your own location trackers and security devices. Add a light and temp sensor, and you could make a weather alarm instead. Imagination and patience (and an Internet connection for instructions) are the only limitations with RePhone. The modular phone is more than just a phone, and seems like a good prototyping option. If you’ve always wanted to make your own Internet of things, there are plenty of backer options based on how much building you want to do. You can grab a RePhone Core GSM+BLE module for only $12, $7 off retail. $29 gets you the Core 3G module (saving $10 on the retail price), and $39 gets you a RePhone Geo or Lumi kit, set to retail for $59. A full RePhone Kit Create goes for a $45 campaign donation instead of $59 retail. The RePhone Extension Pack comes with all the next-level stuff: Xadow GPS, NFC, LED5x7, Duino, GSM Breakout, the Battery and the two cables, for $59 instead of $79 retail. There’s even a kit for Pebble with an adapter, GPS, NFC, a battery and structural support. $109 gets you the Kit Create, the Extension Pack, and a basic Core module. The kits with more modules have extended delivery times , especially the 3G modules, which are set to deliver April 2016. The super early bird Core rewards are set to go out as soon as the campaign ends on October 29.